Not having an oven is getting closer and closer for us as we prepare to finish this remodel, can I get a cheer? A hell yeah? A quiet whimper to dear god just finish this project and move on already? Don’t worry I feel all three of those feelings simultaneously pretty much all the time these days. So lets talk about food instead because I’m all about the redirect now that summer break is almost over, “don’t hit your brother, DO __________ right now!” falls out of my mouth these days more times than I like to admit. We’re going to be crock potting fools for the next few weeks, After this remodel I am well and truly a crock pot/slow cooker make ahead meal fan. I love to drop dinner in at 9 am and know that all I have to do is make a salad or rice or put bread out and dinner is done. Seriously it is so nice to know I have no worries when it comes to dinner time, I can worry about alllll kinds of other things now. Like for example is the violin being practiced enough or when can I go back to bed or how much does gas cost these days? 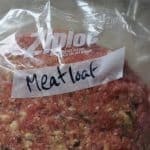 One of our favorite crock pot meals is meatloaf, my kids really really love it and because they do, I DO. They eat it happily and that makes me happy because not one person complains during meal time or picks something apart at meal time. Peaceful meal means good times. I am not preaching to only make kids food they like or dear no if that were the case my kids would subsist solely on mac and cheese, ice cream, pizza and root beer. This is our favorite crock pot meal so far, number 2 would be the Crock Pot Philly Cheese Steak Sandwiches, yum.